Lifting hinges are constructed of telescopic lead plates by lifting the plates from the ground by the lifting hinges at the end of the mast or piling machine. The size of the hole must be properly cut before the fight is necessary to cut well. The hinge can lift the sheet pile onto the fixture at the top of the mast, and then start piling, pile hammer and mast before leaving the piles, and place the hinges on the ground elevation. Pile positioning - plug when the lock port connection will be linked to the vertical link is called interlocking pile. The fight is most likely to cause damage to the piling workers, so a safe construction plan must be developed before construction. 1、lifting equipment or crane must be connected with the pile top, until the steel sheet piles completely fight and support the ground can not let the pile pile free fall. 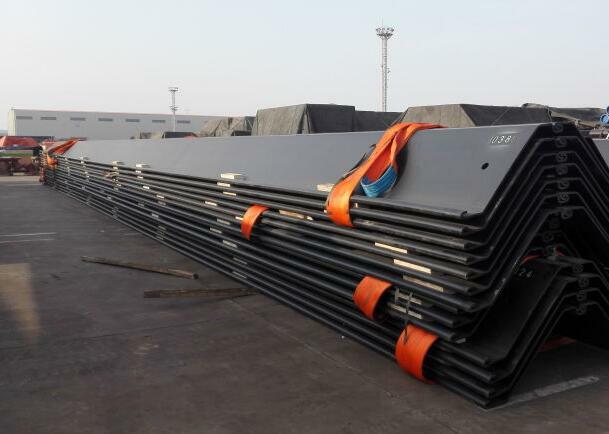 2、the steel sheet pile before the fight or the operation of the lifting of the plate pile free end, the workers must be in a safe working platform or ground operations. When the piles are stuck, the operator must never stand on the ladder of the pile. 3、need to have enough staff to carry out the operation, especially in the windy weather. To have one or two people pull the sheet pile to prevent its swing - if necessary, can be fixed with a rope. When the workers use manual positioning pile, the crane operator should avoid turning or moving the boom. Only when a qualified supervisor gives the correct order can the deck pile be laid. In order to use the Larsen steel sheet pile, it is necessary to set up a suitable temporary workbench and use a special equipment to insert the equipment.